But if you're overwhelmed by the mere thought of figuring out what to buy—not to mention how you'll ever make enough room for all that new stuff—take a deep breath and find out what the experts have to say. 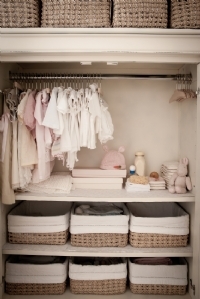 When setting up a nursery, consider your goals before making any purchasing decisions. "You'll want to figure out how much time you have to plan for specifics," says Carly Kirsch, owner of Newly Nested Baby Planning & Consulting Services (www.newly-nested.com). For instance, some companies require a long lead time before an order for a crib, changing table or other furnishing can be filled. "Keeping that in mind when you are shopping for furniture is crucial to ensure you leave time for it all to arrive and be assembled," she adds. Kirsch also suggests thinking about how and when you'll be using the nursery. "Will your baby be sleeping there from the start, or do you plan to have a bassinet or co-sleep for the first few months," she poses. Determining what other rooms in your home you'll be using for diaper changes and nursing may require an additional changing station and comfortable seating, respectively. And when creating a basic layout, don't sacrifice safety for aesthetics and be sure to do your homework. "Don't place furniture such as a toy chest that could act as a step stool near a window, and be mindful of window treatments and blind cord safety," says Shannon Choe, founder of Premier Baby Concierge (www.premierbabyconcierge.com). Since most couples already feel their home is tight on space, it's worth breaking out the tape measure before settling on that matching crib and armoire you've been eyeing. "Make sure the pieces you are purchasing will fit in the space," says professional organizer Kathy Jenkins of Come to Order (www.cometoorderva.com). "You may not be able to purchase a full-size crib, changing table and dresser, and still be able to walk into the room." When possible, look for products that do double duty, such as a crib that converts to a toddler bed or a changing table that can later serve as a dresser. "If you only have room for a crib and a small book shelf, then use bins on the shelf to hold diapers and wipes, and change the baby [on a changing pad] on the floor," offers Jenkins. "Then later use the bins for toys." And don't forget about otherwise overlooked space options. "If the room has a small footprint, look up," says Choe. "Use wall space for creative toy, book and changing supply storage. Think outside the box whenever possible." Since the cost of diapers and formula alone is enough to wipe out your monthly savings, it pays to be resourceful. Kirsch suggests calling upon local consignment stores for hand-me-downs, as well as family and friends who have outgrown their baby gear. "Not only is it a 'green' practice to re-use these typically gently used items, but consignment stores have much higher standards on what they accept," she notes. Products such as swings and bouncer seats often have removable liners that can be thoroughly washed and sanitized. Be sure to check online to ensure that a particular item has not been recalled. Finally, be mindful of what may look pretty isn't always practical. "Don't invest in a big crib bedding set that costs hundreds," offers Choe. "They tend to come with only one sheet, while you'll need several." Instead, stock up and buy three sheets of one style that you really like.